The mid-level edition of Advertising Studio is the Professional edition. Advertising Studio Professional requires a license at an additional fee above and beyond your Salesforce Marketing Cloud account. This edition lets you upload a list of your subscribers’ email addresses or phone numbers to a social or ad network. The network then tries to find those people from that information and present your ads to them. This edition lets you target online ads to particular audiences. For example, if you wanted to test whether subscribers who have become unengaged with your email marketing campaigns respond better to seeing your advertising messages in their social networks, you could create a list of your unengaged email subscribers and target those people as Facebook users. It is possible to accomplish this same functionality manually without using Advertising Studio. However, Advertising Studio makes the process a lot easier and a lot more secure. You don’t have to worry about having your subscribers’ information stolen with this process like you might have to if you were to download the contact information from your CRM and upload it to the social or ad network site. 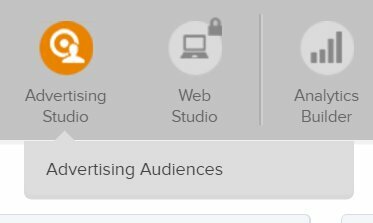 If you’ve purchased Advertising Studio Professional, you can access it by selecting Advertising Audiences from the Advertising Studio category on the app switcher. If you’ve licensed the Professional edition, it appears in the Advertising Studio category alongside Lead Capture. The Professional edition is an app more for connecting data than creating it: You create your audiences in other Marketing Cloud apps and use Professional to connect them with social or ad networks. The social or ad networks show your ads to those users. Advertising Studio Professional does not include performance reporting, but the social or ad studio that you use probably does. Advertising Studio Professional does show you how many subscribers from your audience the social or ad network was able to find among its own users, which correlates to the size of the audience who may see your ad. When you choose the Professional app from the app switcher, an overview screen appears showing all your audiences. After you create an audience, statistics from the social or ad network start to appear in the audience overview screen. The Professional dashboard offers an overview of the performance of the audiences you’ve created. License the professional edition of Advertising Studio. Create a data extension or list that contains the audience you want to target. You can use the Email app or the Contact Builder app to do the technical work of creating the data extension or list, but the hard work of this step comes before that. You need to be thoughtful about which subscribers to include in your targeted audience so you can achieve your business goals. Don’t skimp on the planning step when deciding whom to include on your list. Create accounts with whatever social or ad networks you want to use to place ads, and have your credentials near at hand when you begin using Advertising Studio Professional. When you log in to your social or ad network in one browser tab and then open Advertising Studio in another tab of the same browser window, Advertising Studio will notice the account and ask for permission to interact with it. In many companies, the person in charge of using Advertising Studio in Marketing Cloud is the same person who sets up the company’s social account and purchases the company’s online ads. However, as the online marketing team grows larger, you might find yourself needing to coordinate with someone else who takes responsibility for the company’s social or online advertising presence. Use screen-sharing technology to let the person who owns the ad accounts log in remotely. Make sure the account owner stays in the screen share long enough to approve Marketing Cloud’s permission to communicate with the ad network. Create a Marketing Cloud login for the ad account owner and have that person associate the accounts to your Advertising Studio Professional account. Have the ad account owner grant you admin rights so you can access the ad account from Marketing Cloud. Facebook and Instagram can accept email address and phone number of your subscribers to find matches. Twitter can also accept the Twitter user ID in addition to email address and phone number. Google and YouTube can accept only email. Facebook acquired Instagram in 2012 and joined their destinies. Similarly, Google acquired YouTube in 2006 and brought it under the Google umbrella. Neither Google nor YouTube is exactly a social network; nevertheless, Google works with Advertising Studio as well. For example, you can target the ads that appear when a subscriber uses Gmail (or YouTube, of course). You can also target the ads that appear alongside Google search results. If you’ve ever sold advertising space on a website, you know that you rarely negotiate with the sponsor directly. Instead, you offer a space on your website to an advertising network. The advertising network acts as a go-between, negotiating with the sponsors and choosing the perfect ads to insert into the space you provided. The advertising networks have a surprisingly large amount of data about each person viewing the page. As the ad buyer, you can use the advertising networks’ knowledge to target subscribers even when they access websites other than social networks. This is not an exhaustive list, nor is it a limit on what you can do to target your online ads. 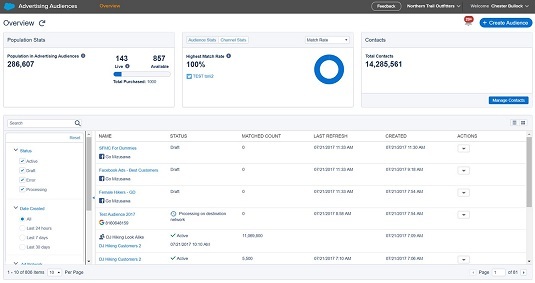 As new social and advertising networks gain prominence, Salesforce Marketing Cloud is likely to expand the functionality of Advertising Studio to support them. From the app switcher, select Professional from the Advertising Studio category. Click the Create Audience button that appears near the top right of the screen. Enter a name for the audience and choose the social or ad network for which you are creating the audience. A list of accounts for that network appears. Select the correct account and click Configure. Template: A template is a predefined definition of an audience based on common use cases. For example, all subscribers who clicked in the last 30 days might be a template. List or Data Extension: You can use this option for subscribers in Marketing Cloud or for audiences you built from systems outside Marketing Cloud. For example, if you created an audience of recent purchasers in your POS system, you could include them in a data extension. Contacts: Audiences from Contact Builder. Select the attributes that you want the system to use to find profiles that match the subscriber data in your audience. Select more than one attribute to increase the chance of finding a match. Indicate whether you want to receive an alert when an audience is ready for use, and then click Activate. It’ a good idea to receive the alert; this step can take a while and, without an alert, you’ll just have to keep checking whether your audience is there to know for sure. Indicate whether you want to refresh the audience manually or on a scheduled basis. It’s more common to schedule audience refreshes because data sources change regularly as part of other schedules. Scheduling the refreshes makes sure that you are always targeting the audience you intend without having to remember to update it manually.